Massive extra experiences the future of tourism - but how far will VR go? TUI Destination Experiences, under whose umbrella the TUI Group has bundled its activities, excursions and round trips, is testing the next generation of experiences. 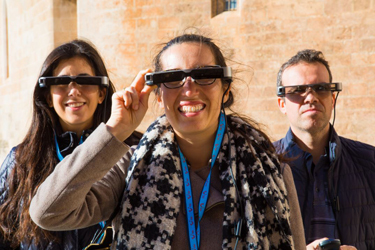 TUI is currently conducting tests in Palma de Mallorca on the use of augmented reality on excursions and activities. Tourists with stereoscopic augmented reality glasses could spray a touch of science fiction in the future. The glasses allow holidaymakers to explore places individually without losing any inside knowledge. In the future, information, photographs, videos and 3D models will be shown right in front of what you are looking at. "Augmented Reality allows holidaymakers a new, more exciting access to historical facts and stories and takes into account the increasing desire of guests to explore cities and towns on their own," explains Chris Carmichael, Head of Innovation at TUI Destination Experiences. "In our experience to date, the spectacles are also comfortable to wear for the user, so that they are not distracted by the actual experience". The trial phase, which will last several weeks over the winter period, is intended to provide TUI Destination Experiences with insights into how the technology can best be used to offer customers the greatest added value. Then it's on to product development so that holidaymakers can soon experience the next generation of experiences for themselves. "We are delighted to be one of the first providers in the world to offer this technology to our guests," says Peter Ulwahn, Digital Acceleration Director at TUI Destination Experiences. "We are convinced that Augmented Reality can significantly enrich excursions and activities and are therefore investing early in this new form of experience". TUI Destination Experiences is working together with Mixed Reality I/O during the trial run on Mallorca. Andy Gstoll, CEO of the company: "Tourism is full of potential for immersive technologies, whether in virtual reality for planning the holiday or in augmented reality during the stay in the destination. As the world's leading company in the sector, TUI is excellently positioned to offer new value-added experiences to travellers with such innovative services".